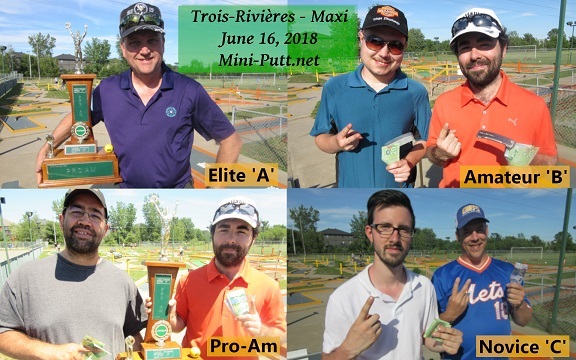 After the first two rounds of the Mini-Putt.net Tour held at Mini-Putt Terrebonne the previous 2 weeks, a picture pefect day was awaiting a great field of 30 players on June 16 at Mini-Putt of Trois-Rivieres for a full day of competition on the Maxi (Orange) course. As usual, the owner of the course, Richard Bourassa, and his team made every effort to provide a course in perfect condition. First on the schedule in the morning is the Pro-Am competition with teams formed per our usual procedure which is explained in this previous article. With the amount of players present, the tournament was reduced to 36 holes from the expected 54 holes. After the 2 rounds, the team of Gilles Girard & Mathieu Labrie, 2 amateurs, won with a total score of 48 (24-24) by 2 strokes over the team of Christian Fournier & Paul Boucher and by 3 strokes over the 3rd place team of Jocelyn No�l & G�rald Therrien. Full results of the pro-am can be found here. 24 players were back in the afternoon for the singles competition in 3 separate classes. In a tournament where changing wind conditions made things harder for everybody, the winner of the Mini-Putt.net trophy is Jocelyn No�l on the 2nd playoff hole thanks to aces on both holes over Michael Chabot. Michael is a local player from Trois-Rivieres that is only in his 3rd competitive year and is already contending with the top players in almost every tournament he enters. Both players finished the tournament with a total of 91 (-17). Jocelyn No�l, for his part, is a 30+ years veteran of the sport and considered by many the best active player. He is one of the great ambassadors for mini-golf and is a model of regularity and competitiveness. He has many TV appearances as a player (45 matches) and also as an analyst for 2 seasons. His record include 6 provincial titles, 1 President's Cup as well as many individual and team titles. He also participated in the more recent webseries projects as a player and as a commentator. Full results of the singles competition can be found here. It is worth mentioning that 2 players who are in their first year of competitive mini-golf finished in the money paying positions in both tournaments. Jean Montambault and Jessie Paill� tied for 4th place in the team competition alongside their veteran partners. The pair finished 1-2 in the novice class in the afternoon with Jessie, in his very first tournament, winning over Jean. Congratulations to both and we hope to see you back very soon! Beside individual tournaments' honors and titles, all players compete for a season long points race to win the President's cup. Points are awarded based on the overall standings of the singles competition where the winner gets 50 pts, 2nd 40 pts, 3rd 35 pts, etc. Points gradually decrease in value down to 14th place who earns 5 pts. Any player that completes the tournament in 15th place or worse earns 3 points. After the 3rd round of the season, the points standings for the race to the President's Cup is extremely tight with Alain Girouard & Maxime Roby tied for 1st place in the overall division with Th�r�se Fournier & Mathieu Labrie trailing only 10 points behind and leading the amateur standings. Also lurking very close are eternal contenders Carl Carmoni & Jocelyn No�l. Leading the standings in the Novice class is Jean Montambault with a very respectable 23 points. Full results available here and here. Next event : Saint-Hyacinthe on June 30 for a Pro-Am followed by 3 rounds of singles play for the Spring trophy on the Mini course.